Forget the El Clasico over in Spain this is the big one.The two bitterest rivals in the English game faced off against each other at Anfield on the same day as Real Madrid played Barcelona. Separated by only two points in the race for an all important top four finish this was by far the biggest match of the season so far for both sides. The last time Liverpool tasted defeat in the Premier League was at the hands of United back in December. Then the hero of the day was David de Gea as he protected United’s three-goal lead with a string of saves that cemented his hero status among the fans. After the brilliant display against Spurs at Old Trafford last week the question on the fan’s minds was whether or not Louis van Gaal would stick with the 4-3-3 system that worked so well and keep Juan Mata in the side even though Angel Di Maria was available after his suspension. All was revealed when the starting line-up was announced: De Gea, Valencia, Jones, Smalling, Blind, Carrick, Herrera, Mata, Fellaini, Young, and Rooney. So Louis van Gaal entrusted the same starting side that demolished Spurs in the finest 45 minutes of the season so far. Which meant no immediate return to the team for Angel Di Maria who started on the bench alongside Falcao. Also, Blind was preferred at left back again in place of the returning Rojo following the Dutchman’s sterling display last weekend. Subs: Da Silva, Rojo, Di Maria, Falcao, Januzaj, Valdes, Pereira. United, in their white strip, started the match on the attack and in the first minute won their first corner. Mata’s delivery caused confusion as the keeper flapped at it. It was a bright start from the away side as they sought an early advantage to quieten down the home support. Fellaini started the match in a fiery mood nipping at the heels of the Liverpool players to great effect. In the second minute, the Belgian won the ball well and fed Rooney but he chose to come inside when the two United players behind him on the flank would have been the better option. A minute later David de Gea was called into action as he saved at the feet of Sterling as he ran into the area unchecked by the defence. In the seventh minute Juan Mata won the first free-kick in a dangerous position and took it himself, however, it was easily cleared. The upside was that it was far better to see the midfield players stepping up to take the free-kicks and, therefore, allow Rooney to get in the box where he can do the most damage. 10 minutes in and United were in confident mood passing the ball around well and not giving the opposition time to settle which made the natives more restless than usual. Mata had started the match in fine form and was unlucky not to get on the end of a Fellaini header after eleven minutes. But a couple of minutes later Mata was rewarded for his endeavour by scoring a goal of pure class. It happened in the 13th minute following approach play by Fellaini who fed an inside pass to Herrera who in turn saw the run of his compatriot and slipped the ball perfectly through to Mata who finished comfortably with a right-footed shot across Mignolet and into the far side of the net. What a strike and a great start for United and fully deserved. Great to see manager and assistant celebrating the goal together with van Gaal fist pumping then jokingly slapping Giggs in delight. Over the next few minutes, Rooney was unlucky to be caught offside a couple of times as the visitors tried to capitalise on their possession and score the vital second goal. It wasn’t until the 16th minute that Liverpool had their first strike when Sturridge fired harmlessly wide. Herrera had been targeted by the Liverpool players for the roughest treatment and after twenty minutes Joe Allen picked up a yellow card after fouling the United playmaker. Another free-kick by Mata was chipped in for Fellaini’s head but again it was easily cleared by the defenders. Fellaini was proving to be a handful for the defenders as he had been in recent matches so much so he was keeping Falcao on the bench even in the absence of Robin van Persie. There was a break in action on 20 minutes after Phil Jones clattered into the back of Lallana and knocked him unceremoniously to the ground. Just before the half hour mark there was a great play from Blind down the left as he almost played in Herrera for a chance on goal instead he won a corner. In the first 30 minutes, it had been all United as the home side struggled to get hold of the ball and create any chances. The biggest cheer from the home fans was when their captain Gerrard warmed up along the touchline. Liverpool wasted a great opportunity in the 34 minute when Lallana blasted wide from 18 yards when in truth he should have done better. A warning to the United defence that the one goal lead was a slender one. United tried to conjure up a second when Mata and Blind linked up but to no great effect. Three minutes before half-time there should have been a penalty awarded to Manchester United as following a corner Liverpool keeper Simon Mignolet appeared to rather stupidly push over Herrara, but the match officials obviously didn’t see it. At this point, United was so much on top that even Chris Smalling tried his luck with a long run into the opposing box but lacked the quality pass needed. 8/10 for effort. On the stroke of half-time, Carrick let fly from distance with a fierce drive which the keeper could only parry clear. Half-time and it was all United as they continued on from the Spurs win with the same momentum and were in total control and passing the ball around well. Herrera and Mata were the stand-out performers as they never stopped running and looked for an opening at every opportunity. At the start of the second half there were no changes to the United line-up but Liverpool made a substitution by bringing their inspirational skipper Gerrard into the play and the first thing he did was to lunge into a tackle then stamp on Herrera’s leg as he was on the ground. A straight red for Gerrard and not such an inspiration, after all. It really was an awful challenge that no one can excuse and Herrera was fortunate to get up and play on. Quite why Herrera received a yellow card for nearly having his leg broken is beyond belief. It couldn’t have been any better for United to play against ten men for forty minutes but as is the same with all teams reduced to ten men Liverpool finally started to play, thankfully without applying any real pressure on David de Gea’s goal. 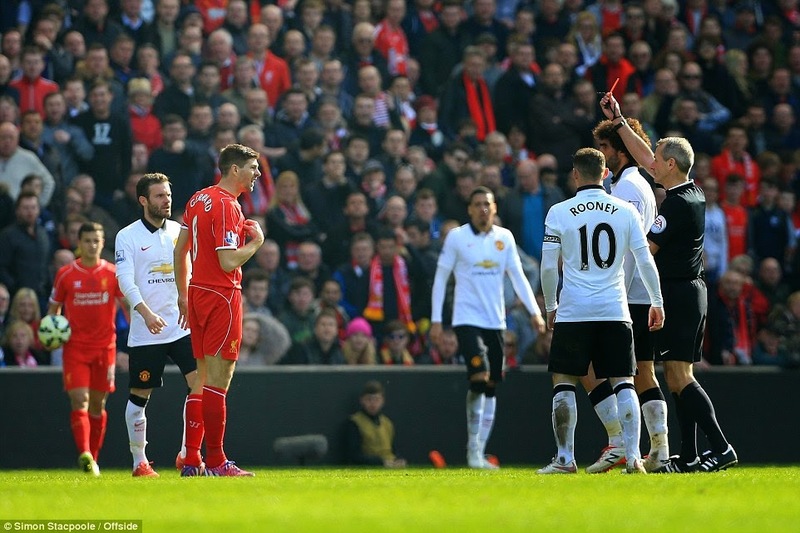 The main objective for United was to keep their cool in a red hot atmosphere created by the Gerrard red card. The atmosphere was hostile towards the Red Devils, to say the least. In the 53rd minute, Coutinho tried to catch de Gea unawares with a long range effort that just went over the bar. United needed to hammer home their advantage and quickly. One minute later Louis van Gaal decided to bring on a fresh pair of legs with Di Maria replacing Young who had had a fairly quiet match up to that point. Phil Jones was booked for a clumsy challenge on Henderson of which he could have had no complaints. Then it happened a moment of pure genius by the player of the match. In the 59th minute, Di Maria picked out Juan Mata in the box with a superb chip and the diminutive Spaniard scored a goal with a scissor kick of the highest quality with his left foot. 2-0 ahead and not only game over but goal of the season decided as the way he executed the goal was spectacular. On the hour mark, Di Maria broke at pace and unselfishly squared the ball into the box aimed for Rooney but the ball was agonisingly behind the England forward. Mario Balotelli entered the fray and was immediately booked for a foul on Jones. This was the home side’s game plan to rattle the United players with over aggressive play. On 68 minutes, Sturridge managed to pull a goal back for the home side after Carrick had uncharacteristically given the ball away. With twenty minutes left all United had to do was hold on while being abused on and off the pitch. A free-kick from Di Maria was punched clear to Carrick who then played the ball back into the danger area where Rooney clashed with Henderson, Skrtel and Mignolet but escaped unharmed and thankfully caution free. Di Maria was guilty of giving the ball away in a dangerous area but thankfully no harm was done in the end but all the same it could have been worse as United only had the one goal lead. United was struggling to make their extra man advantage count since the Liverpool goal and needed to defend resolutely while at the same time regaining their composure. In the last ten minutes, you felt that United needed to grab another goal as Liverpool were starting to create chances and, after all, their hard work would be wasted especially against ten men. In the 82nd minute, Falcao came on for the hard working Herrera which meant Rooney took Herrera’s place in midfield for the last five or so minutes. The Liverpool keeper Mignolet lost the plot around the edge of his area by nearly gifting United a free strike at goal, but he somehow got away with it. Rooney conceded a free-kick in a dangerous area which was cleared by Fellaini and United countered with Falcao down the left but his cross missed everyone. 90 minutes on the clock and Di Maria infuriated his team mates by giving away the ball far too easily when possession was the requirement. Into added time and United eventually started to keep hold of the ball and all that passing paid off when Blind burst into the area and was upended for a penalty by Emre Can. 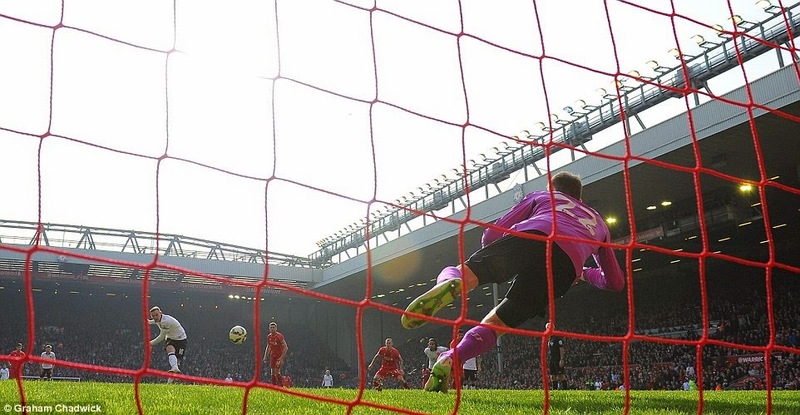 Rooney strode up and placed the ball towards the corner, but Mignolet managed to save at full stretch. Surely it wouldn’t matter as the game had entered it’s last seconds. While everyone concentrated on the penalty Rojo replaced Blind. Skrtel had the last word as he stamped on de Gea and should have seen red for that terrible challenge but like so many of his colleagues got away with it. As de Gea writhed in agony the referee blew for full-time. 2-1 to United. There is no better place for United to win than at Anfield and with the three points they have put some breathing space between themselves and Liverpool and move closer to Arsenal and City. 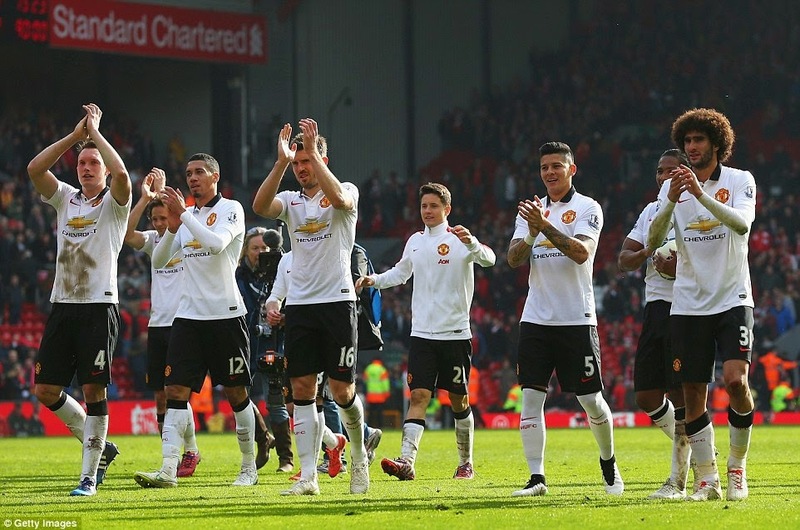 An absolutely brilliant win for United and fully deserved as they were in complete control for the whole match. Many will say that Gerrard’s dismissal changed the outcome of the match, but it had the opposite effect as Liverpool played better when reduced to ten men. You can’t take anything away from the way United approached the match. From the start, they were on the attack and full of purpose a trait rarely seen this season. If only they had turned on the same style earlier in the season. All the players put in a great team effort, but there are two players who deserve the extra plaudits and they are the Spanish duo of man of the match Juan Mata and Ander Herrera. After being left on the bench many times over this season, they proved their class and warranted the starting place given to them by the manager. With Carrick in support, they totally overpowered Liverpool and didn’t allow the home team to get hold of the ball. There will be no match next weekend due to the upcoming round of internationals which is a shame as the break could disturb the momentum that United have built-up. However, on a positive note it will give Robin van Persie the valuable time needed to recover from his injury as his goal scoring feats will be needed for the run in. Previous Better late than never for United. Next Smalling Spurs United On.